I recently was introduced to the world of aviation. I have now flown a plane, taken several flights on a private plane and attended the worlds largest aviation expo. I knew nothing about this world of flying ..But really…. Hello, Gig Harbor- we are home to the Tacoma Narrows Airport. Do you know, this airport is a monitored airport with a maned tower? That is very prestigious in the world of aviation. Let’s become more aware of aviation and what is in our own back yard. We are very blessed to have a local resident (Bob Juranich) that loves aviation and historical aircraft- specifically the restoration of planes. This private exclusive collection of antique aircraft now is open to the community in his own BEAUTIFUL private hangar. Bob will strongly tell you this is NOT a Museum- this is a working hangar for planes that were brought back to life and are in perfect flying condition. Hear what Bob has to say in this exclusive Peninsula Gateway interview. 11 beautifully restored historic planes. The stunning 12,400 sq. ft. hangar with 20 ft. ceilings & highly polished concrete floors. You will meet Bob (and other aviation professionals) who will personally give you a tour of these planes that were literally brought back to life. There will be refreshments throughout the day. Watch a demonstration of how an aircraft is actually covered with a special cloth-really! Visit the Spenser Aircraft display (from Bremerton) of airplane supplies and clothing. Tour a facility that is ready to be a special EVENT VENUE for your private event. See details about the hangar as an event venue at this link. You are all invited next Tuesday (9/17/18) to drop in anytime between 10am – 4pm to visit the local Tacoma Narrows Airport’s Antique Airplane Hangar and expand your knowledge of the world of aviation. 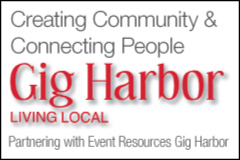 Tour Gig Harbor’s newest event venue- 1/2 price admission ($5) this Tues- Sat (9/17-22) . Kids are free.